If you’re interested in making the most of Virgin Islands sailing charter services, there are many things you need to know in advance before even starting to pack for your trip. The journey may be a long one, and you might be visiting places you’ve never been to before, but just by knowing a few basic facts about local customs or having some insight on the most reputable sailing charterers can make your entire vacation a little bit brighter. What Should You Know Before Visiting the Virgin Islands? The dress code is casual; however, you should wear regular shirts, shorts and shoes in public, while only wearing a bathing suit at the beach. You can use a US driver’s license for up to 90 days while you’re visiting the Virgin Islands. Also, make sure you avoid using your cell phones without an earpiece while driving. Trade winds will usually keep you cool while sunbathing, but that’s no substitute for a good sunscreen, as well as shades and possibly a hat for additional sun protection. When it comes to safety, avoid leaving your car or hotel door unlocked, and don’t answer the door to your room without seeing who it is first. Finding the best charter companies largely depends on how many people are in your group, how long the vacation will last, what types of facilities and equipment you need and whether or not you also have use for sailing lessons. Avoid packing too much and focus on adding all the necessary safety items such as a handheld radio, sunscreen, sunglasses and safety vests. Keep track of the sailing season to get the most affordable services right after it ends or right before it begins. Sopris Charters is one of the few yacht and sailboat charter companies that operate in the Caribbean and Virgin Islands area. 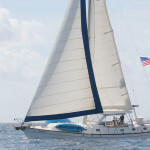 Apart from offering a lot of useful information, tips, advice and resources to help you organize a smashing sailboat vacation, our Virgin Islands sailing charter company can even provide you with various special offers after the sailing season is over – including discounts of up to 50% for visiting places like St. Thomas or Tortola.